As early as the 19th century, Swiss watchmaker Vacheron Constantin pioneered the construction of anti-magnetic watches by using metal alloys imprevious to magnetism. Today, most metal case constructions generally meet the international standard ISO 764 Horology, according to which a case should provide shielding from magnetic fields up to 4800 A/m (Ampere per meter) of strength. In the 20th century, at the request of science labs (including the CERN), Rolex included a Faraday Cage within the case construction and released the legendary Milgauss, which was imprevious to 1000 gauss (80,000 A/m). 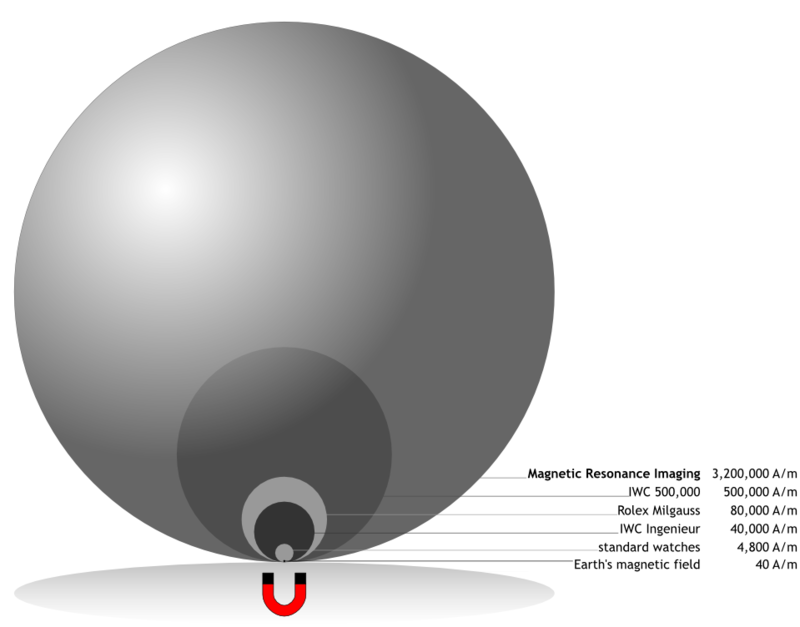 The gauss is a non-SI unit for magnetic flux density; and as an indication, the Earth’s magnetic field amounts to 0.5 gauss (40 A/m). Another Swiss watchmaker, IWC, experimented with both amagnetic alloys and magnetic case shieldings to assemble watches that could withstand magnetic field strength of a staggering 500,000 A/m (6250 gauss). The watchmaker released other antimagnetic watches that were les expensive to produce and were rated between 40,000 and 80,000 A/m. Both Rolex and IWC discontinued their antimagnetic watches but have since released new models. In the meantime, watchmakers such as Ball, Damasko, Orfina, Rock Excel Watch and Sinn have also learned how to make 50,000 to 100,000 A/m antimagnetic watches. One point of interest – Faraday cages do not provide protection against any degree of static magnetic field. Even the earth’s field of 40A/m will penetrate a Faraday cage, allowing a compass to still function correctly inside one. Maybe Rolex deploy methods other than the Faraday cage to achieve the anti-magnetic properties of their Milgauss. Interesting article, and interesting point made by Image Doctor. However, as an additional observation, I should point out that a “Faraday Cage” is technically a shield against electrical fields, not magnetic fields. The magnetic shielding used in watches and other instrumentation cannot strictly be called a Faraday cage. Just a semantic point.